Welcome to NextProject - your students’ opportunity to learn about the exciting world of electrical and software engineering. Through NextProject, your students will begin by learning about the basic principles underlying digital devices and software systems. Then, they will be able to follow along with our projects and apply the knowledge they have learned as they build them step-by-step. After, completing the projects they will continue on and build their own projects. 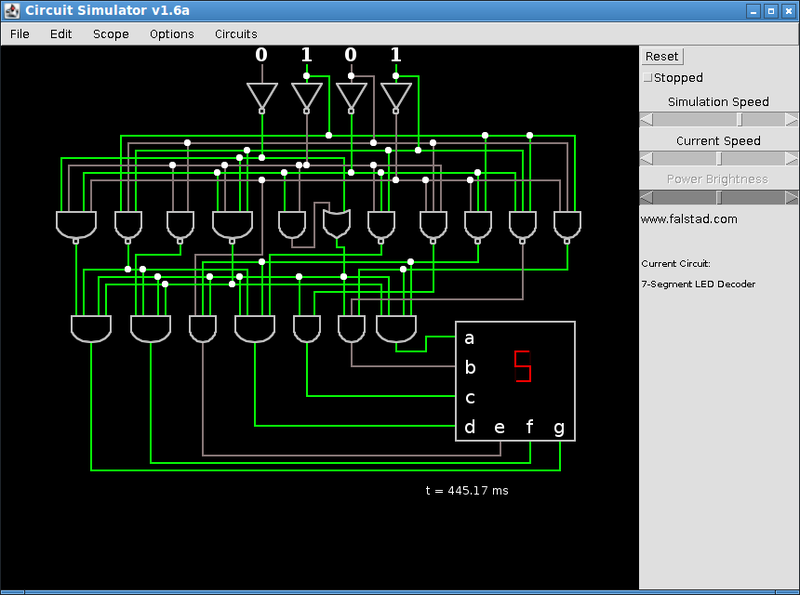 This screenshot demonstrates the circuit simulator running an included example, the 7-Segment LED decoder. The LED screen displays the number 5 because binary number 0101 is decimal number 5. Creating a circuit is simple. Click on circuits and then Blank Circuit. Right click the work area and then select the component you want to add. Draw the circuit by holding and dragging the left mouse button. Screenshot of a 9V battery powering a red LED through a 470𝛺 resistor. 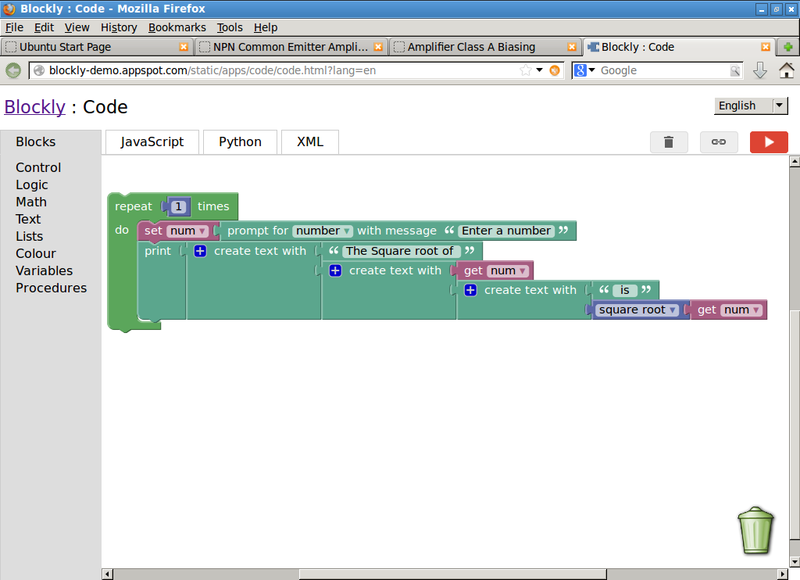 Fritzing allows the user to design a circuit through an intuitive drag and drop interface. 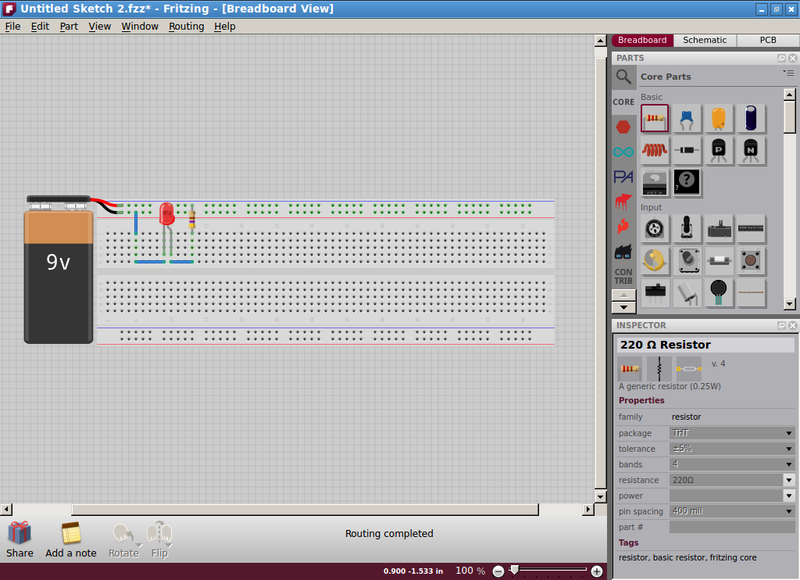 Fritzing can also create schematic diagrams and printed circuit board traces. For example, to light an LED from a battery source, you can not input more current than a certain current value - known as maximum threshold. If you exceed the threshold, the LED will be damaged. 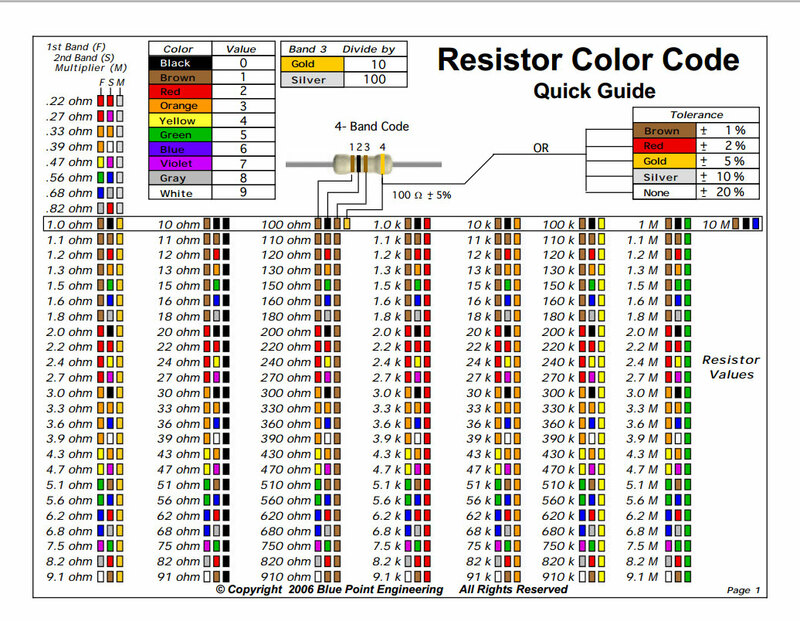 A resistor is thus mandatory in this situation. Microprocessors like Intel Core i7, AMD RAM, and many computers and other circuitry contain resistors. Without them, modern life would not be modern! A capacitor works like a small rechargeable battery, it holds a charge. The SI unit of capacitance is the farad, which is equal to one coulomb per volt. Capacitors are commonly used in electronics when a signal needs to be filtered or when a large amount of power is needed for a short amount of time, such as starting a large motor. An inductor is simply a coil of wire. It stores energy is the form of a temporary magnetic field and resists to changes in current that is passing through it. The unit for inductance is the henry (H) which is the ratio of the voltage to the rate of change of current. 1 H = (V * s)/A. Where V is voltage in volts, s is time in seconds and A is current in amperes. Inductors are commonly used in electronics to filter signals and to build up large voltages such as those needed for spark plugs. The name integrated circuit is pretty self-explanatory. Commonly called chips, integrated circuits contain commonly used circuits, such as amplifiers, in a small sized rectangular part that has pins to interface with other hardware. Integrated circuits have the advantage that they are smaller, cheaper and use less energy than their discrete component counterparts. A computer microprocessor is an example of many complicated circuits built into a small integrated circuit. An antenna is an electrical component that converts, in both ways, between electric power and radio waves. It is used for transmitting and receiving radio signals. In today’s electronics it is found in everything that uses radio waves for wireless communication. This includes technology such as Wi-Fi, FM and AM radio and cellular networks. A soldering kit contains a soldering iron, solder and flux. Solder is a tin based alloy which is melted by the soldering iron and is used for making solid electronic connections. This can be connections between wires or connections on a circuit board. Flux is a chemical agent that is applied to connections before they are soldered so that the solder flows freely and makes a clean, solid connection. A USB oscilloscope is a tool that displays electrical signals on a computer so that they can be analyzed. It may also have a function generator which will output a chosen waveform with a given amplitude and frequency so that circuits can be tested to see how they will react to the signal. Buy in bulk - Shipping is expensive and if it’s something like resistors, you’ll use many so get the best value and buy in bulk. Buy variety packs - In your bulk orders, select the bulk option that has a variety, since you need a wide variety of them. 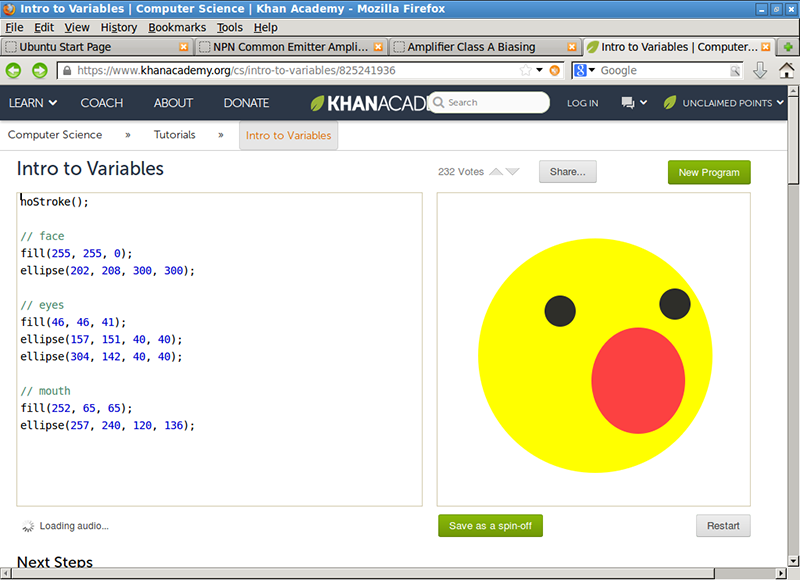 Khan Academy’s programming tutorials are based around drawings and animations. This example draws a face from geometric primitives. It helps beginner programmers by providing them with the functions to draw the shapes. A simple Blockly program that gets a number from the user and shows them the square root of that number. The program runs entirely in the browser. Programming in Blockly requires the user to drag control blocks onto the screen and then fill them with commands which manipulate variables, get input and display output. 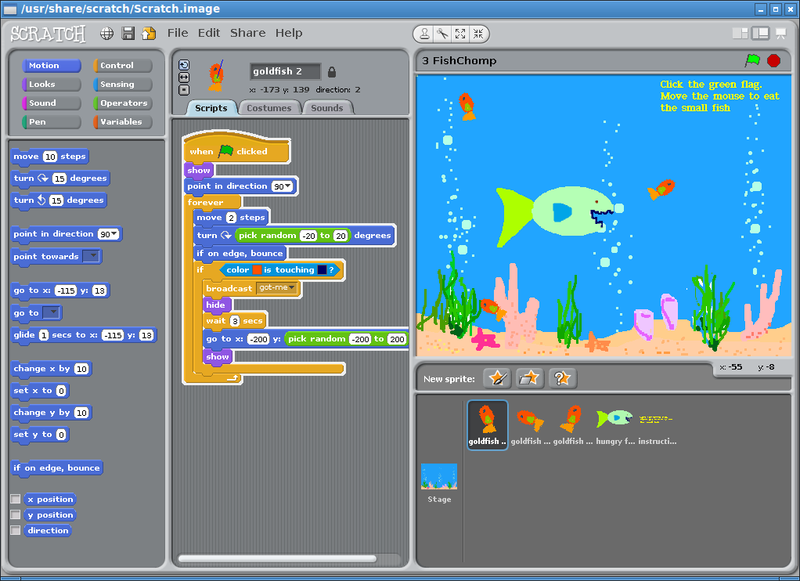 A game’s logic is implemented in Scratch by dragging and dropping blocks. A simple game can be created with just a few blocks. 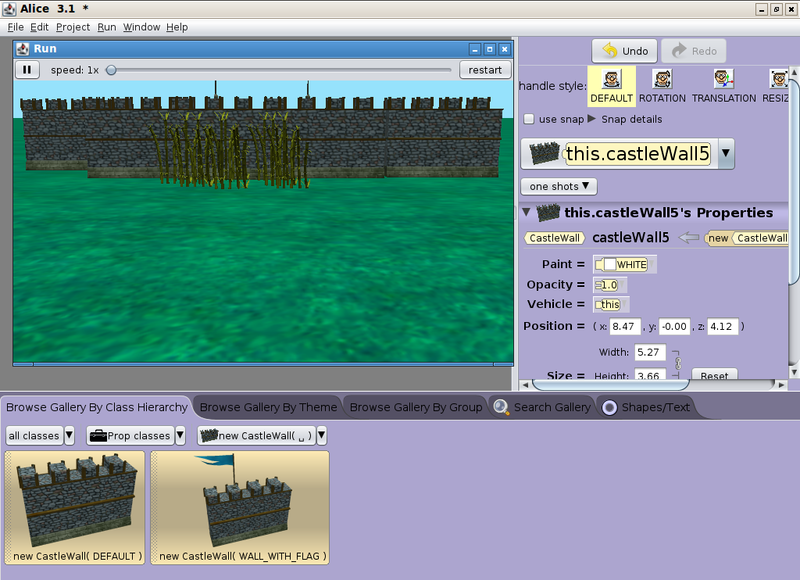 Building a game with Alice requires the user to add objects to the scene. These objects can be referenced and manipulated in procedures within the game’s “code”. Event listeners can be added to respond to key and mouse events to control the game. Play My Code running the hello world example. 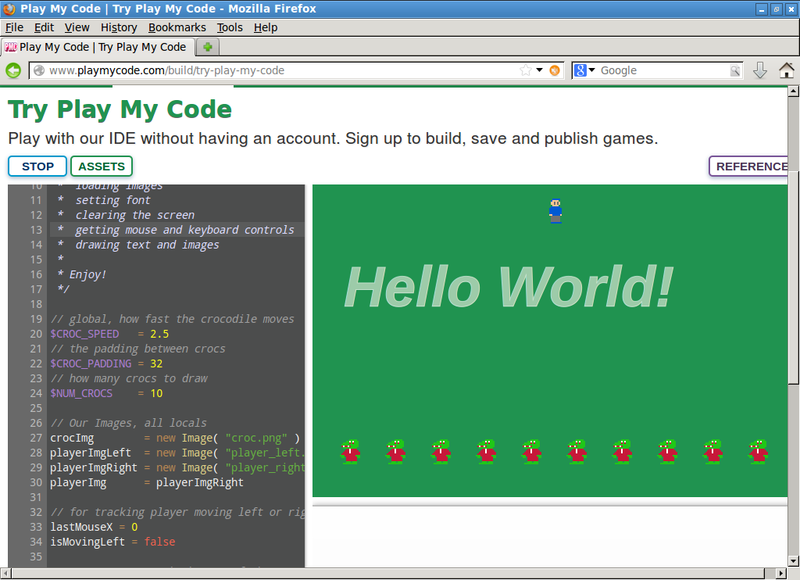 The source code IDE (integrated development environment) is on the left and the game is running on the right.